Location of Monroeville in Monroe County, Alabama. Monroeville is a city in Monroe County, Alabama, United States, the county seat of Monroe County. At the 2010 census its population was 6,519. It is known as the hometown of two prominent writers of the post-World War II period, Truman Capote and Harper Lee, who were childhood friends in the 1930s. Lee's 1960 novel, To Kill a Mockingbird, earned her the Pulitzer Prize. The lasting fame of To Kill a Mockingbird became a tourist draw for the town. In 1997, the Alabama Legislature designated Monroeville and Monroe County as the "Literary Capital of Alabama." The town was initially known as Walker's Mill and Store, named for Major Walker, the area's first white settler. In 1832, the county seat was relocated to Monroeville from Claiborne on the Alabama River. The settlement was briefly renamed "Centerville" due to its location in the center of the county, but then it was formally changed to Monroeville. The town was not formally incorporated until April 15, 1899. Monroeville is located at 31°31′5″N 87°19′39″W﻿ / ﻿31.51806°N 87.32750°W﻿ / 31.51806; -87.32750 (31.518075, -87.327543). According to the U.S. Census Bureau, the city has a total area of 13.4 square miles (34.7 km2), of which 13.4 square miles (34.6 km2) is land and 0.0077 square miles (0.02 km2), or 0.05%, is water. Almost all of the urban area lies on Bama fine sandy loam. Less developed areas around town are mostly on Saffell gravelly sandy loam or Flomaton gravelly loamy sand. As of the census of 2000, there were 6,862 people, 2,687 households, and 1,870 families residing in the city. The population density was 525.8 people per square mile (203.0/km²). There were 3,016 housing units at an average density of 231.1 per square mile (89.2/km²). The racial makeup of the city was 53.09% White, 44.84% Black or African American, 0.38% Native American, 0.58% Asian, 0.15% from other races, and 0.96% from two or more races. 0.90% of the population were Hispanic or Latino of any race. There were 2,687 households out of which 34.3% had children under the age of 18 living with them, 48.0% were married couples living together, 18.9% had a female householder with no husband present, and 30.4% were non-families. 28.0% of all households were made up of individuals and 11.7% had someone living alone who was 65 years of age or older. The average household size was 2.46 and the average family size was 3.04. In the city, the population was spread out with 27.7% under the age of 18, 8.9% from 18 to 24, 24.6% from 25 to 44, 22.2% from 45 to 64, and 16.6% who were 65 years of age or older. The median age was 36 years. For every 100 females, there were 82.0 males. For every 100 females age 18 and over, there were 76.4 males. The median income for a household in the city was $28,229, and the median income for a family was $36,476. Males had a median income of $35,600 versus $20,184 for females. The per capita income for the city was $17,070. About 20.4% of families and 23.0% of the population were below the poverty line, including 29.0% of those under age 18 and 19.2% of those age 65 or over. As of the census of 2010, there were 6,519 people, 2,656 households, and 1,723 families residing in the city. The population density was 488 people per square mile (188.4/km²). There were 3,056 housing units at an average density of 228.1 per square mile (88.3/km²). The racial makeup of the city was 55.7% White, 42.1% Black or African American, 0.3% Native American, 0.3% Asian, 0.3% from other races, and 1.2% from two or more races. 0.8% of the population were Hispanic or Latino of any race. There were 2,656 households out of which 28.4% had children under the age of 18 living with them, 39.8% were married couples living together, 21.1% had a female householder with no husband present, and 35.1% were non-families. 30.5% of all households were made up of individuals and 12.9% had someone living alone who was 65 years of age or older. The average household size was 2.37 and the average family size was 2.95. In the city, the population was spread out with 24.6% under the age of 18, 9.4% from 18 to 24, 21.8% from 25 to 44, 26.2% from 45 to 64, and 18.0% who were 65 years of age or older. The median age was 40.2 years. For every 100 females, there were 87.7 males. For every 100 females age 18 and over, there were 88.5 males. The median income for a household in the city was $31,593, and the median income for a family was $49,548. Males had a median income of $41,324 versus $31,033 for females. The per capita income for the city was $20,553. About 23.3% of families and 27.7% of the population were below the poverty line, including 37.3% of those under age 18 and 19.0% of those age 65 or over today. Monroeville is home to Alabama Southern Community College, a state-supported, fully accredited, comprehensive two-year college serving southwest Alabama with its main campuses in Monroeville and Thomasville. Author Harper Lee was born and raised in Monroeville. Her 1961 novel To Kill a Mockingbird, which received the 1961 Pulitzer Prize for Fiction, modeled the fictional town of Maycomb based on her hometown. Truman Capote, a childhood neighbor and friend of Harper Lee, grew up in Monroeville. Capote acknowledged being the inspiration for the book's character, Dill. Mark Childress, novelist, and Cynthia Tucker, syndicated columnist and winner of the 2007 Pulitzer Prize for Commentary, were also born in Monroeville. As of 2006, an estimated 30,000 tourists visited Monroeville annually due of its association with To Kill a Mockingbird. 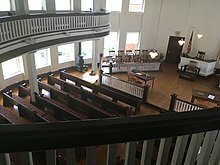 Each May, the Monroe County Heritage Museum stages an amateur play based on the book on the grounds of the courthouse. The interior of the courthouse was used as a reference for the film version of the book, and it is the venue for the later acts of the amateur production. The all-volunteer cast has been invited to perform in Washington, D.C., Kingston upon Hull, and Jerusalem. In 1997, the Alabama Legislature designated Monroeville and Monroe County the "Literary Capital of Alabama." ^ a b "Geographic Identifiers: 2010 Demographic Profile Data (G001): Monroeville city, Alabama". U.S. Census Bureau, American Factfinder. Retrieved February 1, 2013. ^ "Monroeville - Encyclopedia of Alabama". Encyclopedia of Alabama. Retrieved 16 October 2017. ^ "SoilWeb: An Online Soil Survey Browser - California Soil Resource Lab". casoilresource.lawr.ucdavis.edu. Retrieved 16 October 2017. ^ "American FactFinder". United States Census Bureau. Retrieved 2015-08-05. ^ a b c Theroux, Paul. "What’s Changed, and What Hasn’t, in the Town That Inspired To Kill a Mockingbird", Smithsonian (magazine), July 2015. Accessed May 7, 2017. "Lee's Maycomb, indelibly evoked in the novel that sells a million copies annually, endures in the small-town reality of Monroeville.... The town boasts that it has produced two celebrated writers, who grew up as neighbors and friends, Truman Capote and Harper Lee. Their homes no longer stand, but other landmarks persist, those of Maycomb, the fictional setting of To Kill A Mockingbird." ^ "Truman Capote". Encyclopedia of World Biography. Advameg, Inc. 2003. Retrieved June 29, 2015. ^ "discover literary heritage". Discover Monroeville. Retrieved 7 May 2017. This page was last edited on 6 April 2019, at 03:00 (UTC).